We will be celebrating Epiphany and the customs and traditions of the target language countries at the start of the New Year. 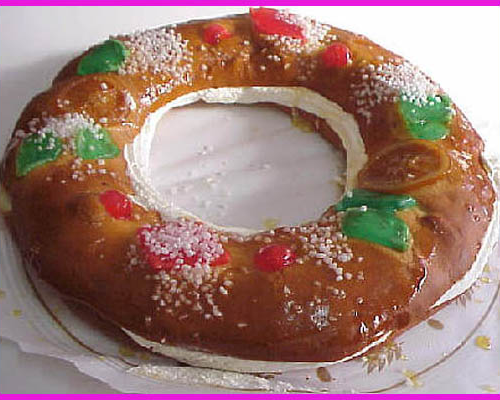 Let's play "Pass the galette" or "Pass the roscon de reyes"
We can revisit familiar language and remind children of the sound letter combination links in the target language you are learning in school whilst celebrating the culture. It's a really easy game that involves the children working in teams and they have loved it when I have played this before. You need two circles of card. One circle is made of white card and the second card circle is made up of at least 12 different colours. On the reverse of five of the pieces of coloured card, glue a picture of one of the three Kings. Blu-tac each of your card pieces in the shape of a circle back on to your white card circle with the Kings hidden on the underside and randomly placed in the circle. Show the children a real picture of a galette or a roscon de reyes or even better share a real cake with them ! Explain that normally the children take a piece and hope to be the child who finds the special counter to become King for the day. Each team must ask politely for a piece of your cake.They must ask for the colour of the piece of cake they want and then the team must look at the sound -letter combination and think of a word they know in the target language that has the letter combination they can see written on their piece of cake. Does the class agree that this word has the sound- letter combination in it ? If they are correct they win that piece of cake and can turn it over .If it has a King on the back then they have won one of their three Kings and can keep the piece of card. At the end of the game if there is no clear winning team then which team has the most Kings? You can play this game multiple times and also with children at different stages of language learning with different clue types on your pieces of cake..It's great fun and allows the children to revisit familiar language and make those all important sound- letter links in the target language.